Maybe a little large for our garden – but something smaller would be good. Yesterday the sun came out and the countryside was suddenly green. After a spring which seems to have got lost along the way leaving in its stead rain, hail and wind with a cold edge, yesterday was warm, almost hot – at least for Scotland. Overnight, winter clothes were ditched in favour of summer gear. Last week we noticed a banner advertising a plant sale, so as we have lost lupins and daisies, pinks and Japanese anemones, and goodness knows what else from our long border at the back, yesterday afternoon we headed for the sale. 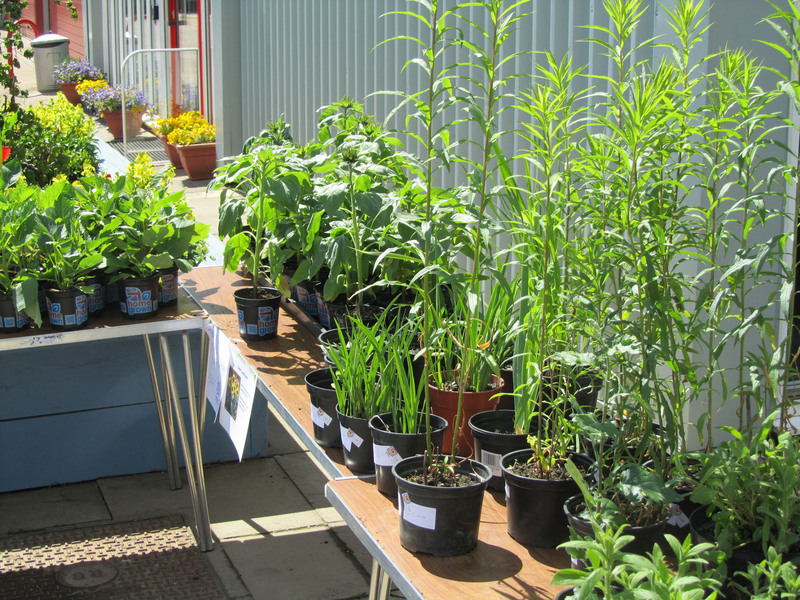 It was being held in the Borders College agricultural campus where plants raised by students on their horticultural courses were being sold off. 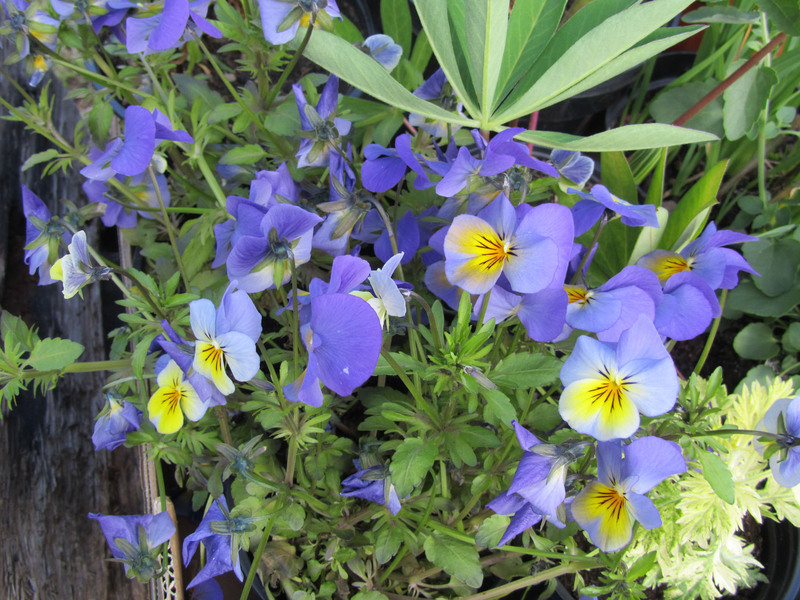 Plants for sale – now what should we choose? We left with a box of assorted plants to fill the gaps left by those that didn’t make it through the cold winter and soggy spring. Couldn’t resist the colour of these little beauties. Bet the rabbits like them! Where we now stay is beech tree country. Lots of wonderful old trees with twisted and gnarled roots, and beech hedges bordering roads and fields. In winter their old copper leaves add a touch of colour and warmth to grey skies and brown fields. Now their new acid green leaves bring exuberance to the landscape. 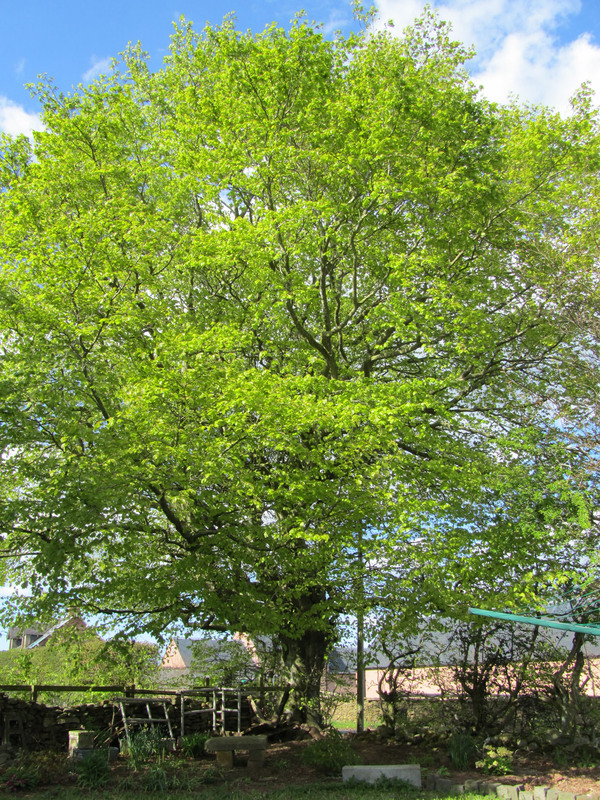 The beech tree at the foot of our garden – its leaves have just come out and look wonderfully fresh and exuberant. At the end of our garden grows a large beech tree, planted by someone eons ago when our garden was a field. Another, with copper leaves, dominates another part of the garden. Although not trees suited to most gardens, we could never cut them down so just work around them, and some ground-cover flowering plant has happily established itself beneath the spread of their branches where grass fails to grow. 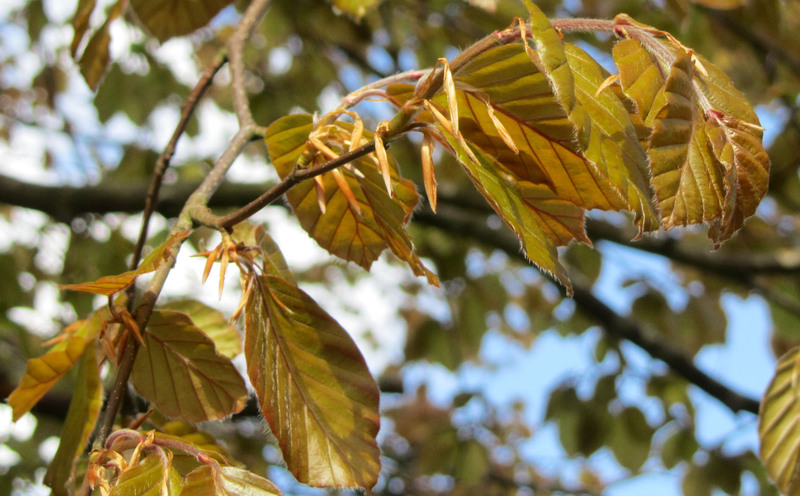 The coppery colour of the leaves of this beech are rich and glorious. The Scots Pine comes into the same category. It’s a tree of fields not gardens, but I love its foliage, the lopsided appearance – they are susceptible to losing branches – and their patterned bark like bolts of locally woven tweed. Along the boundary at the back we have hawthorns and rowans – got to keep the witches away! Amongst the non-native trees our willow leaved pear has thrived, providing a contrast in leaf shape and colour. Some bamboo that initially did reasonably well didn’t make it through the winter before last, but its canes are still standing. Yet more contrast comes from a cherry with purple foliage but disappointingly small pink flowers. Pheasant berry, brought from the west coast, thrives, and can be heavy with sprays of wine-coloured, bell-like flowers – though can be decimated by the winter weather. However it usually regenerates or we discover a seedling to plant. 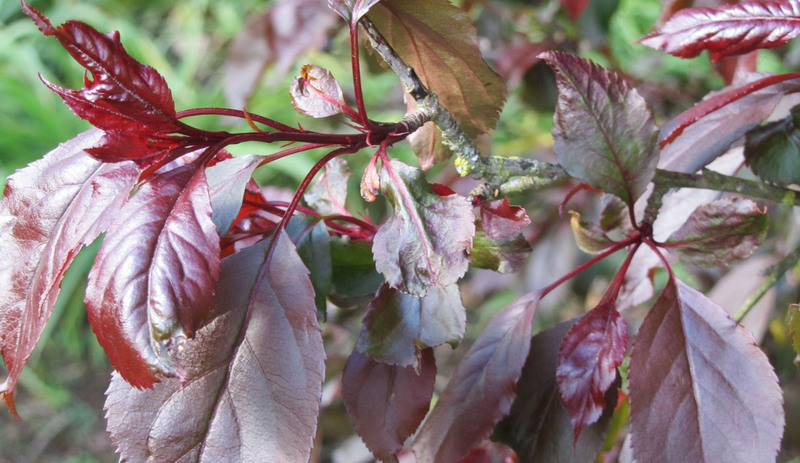 This cherry’s leaves are more spectacular than its flowers – much longer lasting too. A Kilmarnock willow – a small (about four feet high) willow that delights us with its weeping habit, was planted in one of the beds, but has now been moved by husband to a position on its own. I wonder if in its new position it will survive the ravages of marauding hares in winter. 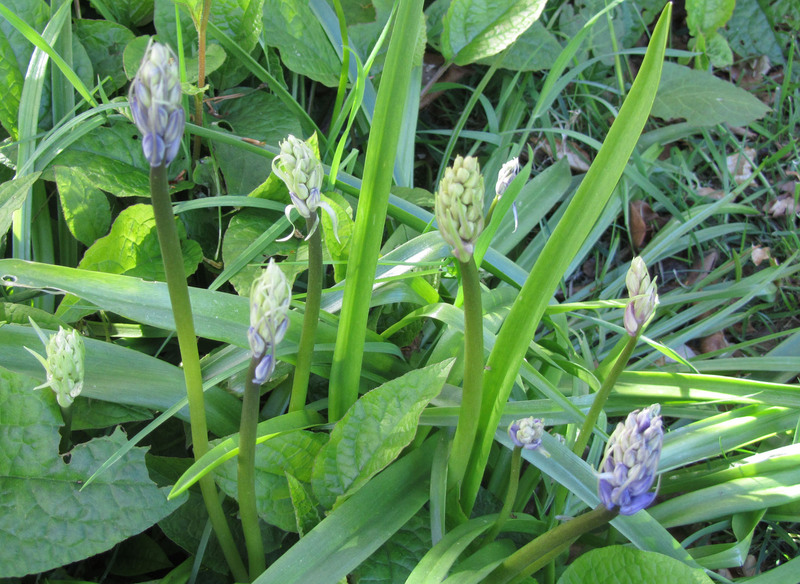 The bluebells are up and thinking of flowering in our country garden. Although this is a place of beauty, it is also a place where not only the weather but also the wildlife makes growing things difficult and where only the hardy survives. 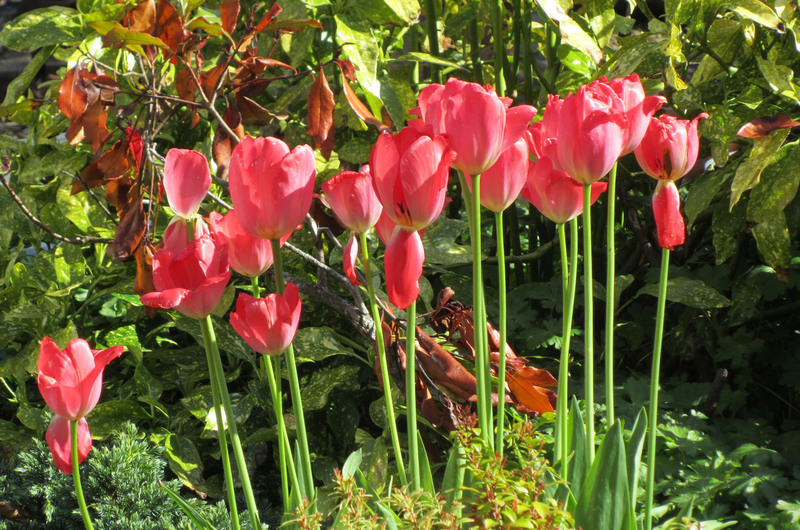 Red tulips, almost over but still providing wonderful colour. They haven’t lasted long this year – didn’t like the torrential rain and hail – who can blame them! This entry was posted in The environment and tagged beech tree, bluebells, Borders College, plants, tulips. Bookmark the permalink. I’d take the tree’s over flower loving soil anyday! Here we get despondent because of the monkeys – rabbit’s and witches – not so much:) Although at the rate I manage to grow anything in my garden, one would suspect an army of opponents is quietly working in opposition to my efforts! You Beech tree is magnificent. Don’t know if I could cope with monkeys! Yes, I like trees, especially old trees. Come snow or sun they’re always there, dressed or undressed, looking luscious or skeletal, but always interesting. And after they finally keel over, they can be made into beautiful, long-lasting objects. How exciting! I’m into urban gardening in Tokyo. Yes, I’m trendy, and I wouldn’t mind stopping by this sale and do a bit of cheating. Urban gardening in Tokyo somehow makes me think of pots – probably because I thought space was at a premium with things like golf courses situated on flat roofs of office blocks. You obviously need to provide us with some photos. Seems like it was a rough winter everywhere, and a slow, cold, wet spring too. So many gardens have suffered. Love the photo of the beech tree. What a fine, venerable specimen it is! Is that a sand cherry in the photo below it? Willows…love ’em! I am a tree fancier too. I don’t think we’ve every identified what sort of cherry it is. It was in the garden when we moved her many years ago. Sand cherry – have never heard of that – must look it up. The flowers are small and deep pink – not very noticeable, but the leaves are a lovely colour and the tree is obviously hardy as it has survived pretty low temperatures here for sometimes prolonged periods. The sand cherry in my yard has pale pink flowers, but perhaps there are cultivars with other colours too. They’re small, but in spring there are so many that they are quite visible. It’s really the foliage that’s the attraction though. It might be a sand cherry but not sure. We have very heavy red clay soil which it has survived in, but that, or the weather, may have affected how it flowers as I don’t ever remember seeing many. Where we stay is about 700 feet above sea level, in an exposed position so everything has to be pretty tough to thrive here. If the cold winters don’t do for plants and shrubs, then the cold easterly winds of spring often do. Some of my garden deals with harsh winds and very cold winter temperatures, and a salt spray from a nearby road. When putting in anything new, I should check with you to see if it has survived where you are, because it sounds like you have an excellent testing ground for hardiness.